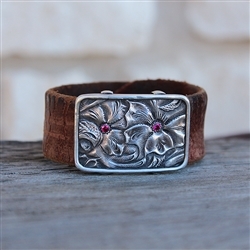 This handmade custom leather cuff features a saddle pattern with lab-grown rubies in the center of each flower. 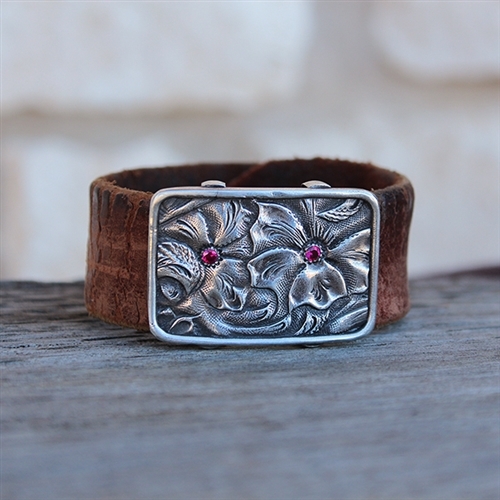 The silver portion of this cuff measures 1 3/4" wide x 1 1/8' tall. However, it can be recreated for you. The listed price is for lab-grown rubies, but real rubies and other stones/gems are available as well. Price will vary by the type of stone/gem chosen.